Depp wanted to break stereotypes, he said. "The whole reason I wanted to play Tonto is to try to [mess] around with the stereotype of the American Indian," Depp said. The actor, known for elaborate on-screen costumes, is set to star as Tonto — the Lone Ranger's Native American companion — in a film based on the 1950s-era television show. And his Tonto interpretation, which includes ample face paint and a full bird head-piece, is a giant leap from actor Jay Silverheel’s costume. Depp, 48, told Entertainment Weekly that he developed the new look after seeing a painting of a Native American by the artist Kirby Sattler. He said he was immediately attracted by the lines of paint on the man’s face, which, Depp explained, looked to him like a cross section of the subject’s emotional life. Depp also got his inspiration for the headdress he wears in the film from the painting. “It just so happened Sattler had painted a bird flying directly behind the warrior’s head. It looked to me like it was sitting on top,” Depp said. According to Entertainment Weekly, Sattler’s original painting, “I am Crow”, refers to the Crow people, who were native to the northern part of the American Midwest. 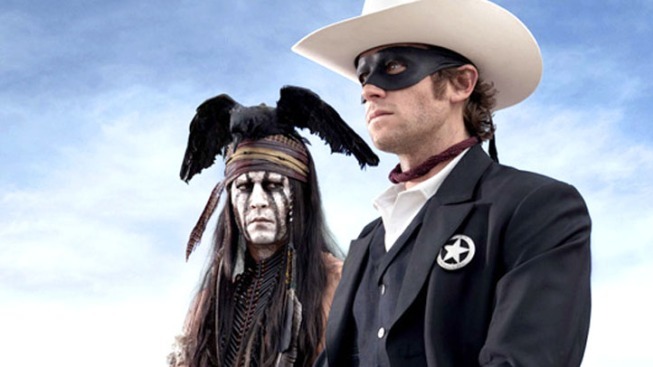 Tonto, in the “The Lone Ranger,” is a full-blooded Comanche. Some in the Native American community have expressed concern that the portrayal of the character is not historically authentic, but Depp said his version of Tonto is honorable and self-reliant, according to Entertainment Weekly. “The whole reason I wanted to play Tonto is to try to [mess] around with the stereotype of the American Indian that has been laid out through history, or the history of cinema at the very least — especially Tonto as the sidekick, the Lone Ranger’s assistant.” he said, “As you'll see, it's most definitely not that." “The Lone Ranger” hits theaters May 13, 2013.